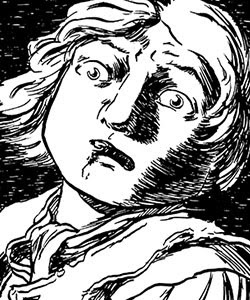 My interview with Seamus Heffernan, creator of the new Revolutionary-era comic Freedom, turns to his storytelling. B75: Freedom starts with a farmboy named Adam Farr heading into Boston to become apprentice to a merchant, It seems to a coming-of-age story. Why did that feel like the right way to approach this topic? SH: When it comes down to it, Freedom is essentially the coming-of-age story of a nation (though perhaps not the one that readers assume it will be). I wanted the main protagonist’s situation to mirror the situation of the colonies as a whole. Like the recently defeated revolutionaries, his independence is snatched from him the moment he reaches it. And I’m pretty sure every one of us remembers what it was like as a teenager, yearning for the moment when you can throw off your parents’ yoke and strike off on your own. I feel like if the reader can identify with the character’s situation, and the character’s situation is a metaphor or representation of the larger scene, the reader has a wider experience with which he can engage the story. Also, the contract between the Farrs and the merchant regarding Adam’s apprenticeship becomes a fairly important plot point later on, but I won’t divulge those details. B75: You mentioned that you began Freedom “when we were hot and heavy into the war on terror” in 2005. 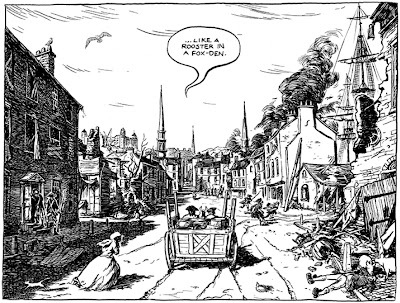 Clearly that environment shaped some of the scenes in the first issue—for example, as the Farr brothers go through a military checkpoint at the gate of Boston. Do you want readers to draw direct parallels, or to look at all the situations in new ways? Both, actually. During my research I was struck by all of the parallels of our founders’ struggle to rid themselves of the British military and that of people in the Middle East struggling against their own enemy, which happened to be us. Regardless of the reasons why, nobody likes it when an army lands on your shores and starts pushing you and your countrymen around. And when that force is overwhelmingly more powerful, you often rely on tactics your enemies decry as craven, dishonorable, even immoral. I think it’s important for us to remember that we came from a stock of folk whose “betters” reviled them as traitors and terrorists. It’s also important to remember that in many cases, our founders acted as such, out of necessity. So I’d like for my readers to draw parallels so that they can look at all the situations in new ways. B75: The end of issue No. 1 promises the next story will be about an enslaved girl from Georgia named Minerva. Obviously, since this is a parallel-world version of the Revolution, the war doesn’t have to stop after four more years in 1783. How many plot threads do you have planned out, and how long do you want Freedom to be? That question is still a little loose in my mind, but I can say that it’s going to be very long. I have a huge, complex epic with many, many plot threads laid out in general, but I honestly have no idea how long it will take to complete. I’m shooting for 3 “books” containing 5-6 chapters, each chapter being a full issue like Freedom No. 1. My greatest wish is to be able to put out one a year, but the style I’ve chosen and the demands of my commercial art career seem likely to hinder that dream. But regardless, I’m more excited about this project than any other I’ve ever undertaken, and have resigned myself to the notion of it being my life’s work. So this day or the next, it will be done, and it should be a really fun ride along the way. TOMORROW: The technical side of publishing a Revolutionary comic.